Deciding for yourself that evaluating your church with simple questions is one thing. Getting your leaders onboard with the idea is another challenge. That’s why I created this Church Evaluation Master Class. I taught it a couple years ago as one session in a year-long mentoring course with over 100 pastors and church leaders in the room. It’s the fruit of 25 years experience as a church planter, lead pastor, get ‘er done, do what it takes to lead people to Jesus and grow the church kind of guy. Now I want you to have it, too. Because it helps to have someone else tell your leaders that your church should, and can, evaluate and improve. I hope you’ll get this Master Class, set a date for a staff training or leaders workshop, show the video, and lead the discussion to equip your leaders to take action to evaluate and improve. This Church Evaluation Master Class will make it easy for you to break limits and spark engagement in your church. You may wonder if it’s necessary to evaluate your church. Trust me, everyone else is evaluating your church every weekend. You may not want complicated surveys or demographic studies. Me, neither. Simple church evaluation is just straightforward questions to measure and assess. To see how to get better. You may think you don’t have time for more thing. That’s the beauty of this video master class. You will equip and inspire your leaders to take initiative to ask simple evaluation questions. You may think that your congregation won’t be willing. Just start with a few leaders who are willing. When others see progress, they will get on board. You may think you’ll get criticized. Maybe. It’s an occupational hazard. But you know that you will also take criticism if you don’t do anything. You may think it’s too hard to get your church to do this. It’s a culture-shift for a church to measure, evaluate, and improve. But it’s not hard if you use this master class to get started. A Lesson Note handout for each person to follow along and take notes on the video to remember and apply the principles and practices. A Discussion Guide so you can facilitate your staff and leaders buying in, applying, and taking action to evaluate and improve. An Implementation Checklist to make it easy to see how to develop an Evaluation System in your church. A Board retreat agenda so you can build into your Board and show them the value and results of evaluation. An audio download of the teaching so you can listen on the go. No worries. It comes with a 30-day Money Back Guarantee. Get the Master Class, take 30 days to preview the video and the handouts, and if you don’t think it will help your staff and leaders, we will refund your money. No hassles or questions. 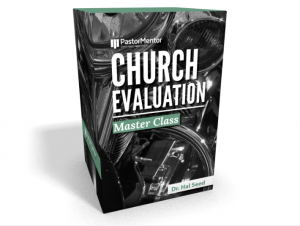 Get the Church Evaluation Master Class today!